GALION — Marion Harding was in town on Friday night to meet up with the Galion Tigers at Unckrich Stadium in Heise Park. The Presidents came into the Mid-Ohio Athletic Conference game after upending North Union last week. Galion was looking to bounce back after a home loss to Jonathon Alder. Chase Cooke and Harrison Ivy were both back in the lineup for the Tigers after missing some time with injuries. Galion was hoping this would provide the spark necessary to propel them to a much-needed conference win. However, Harding had other things in mind and went back to Marion after a 40-12 victory over the home team. The Tigers were the first to find the endzone Friday night. Cooke hooked up with Caleb Ivy for a 52-yard touchdown pass. The extra point from Connor Moreton was blocked, but Galion was up early, 6-0. Harding was next to score, but missed the PAT to even the score at 6-6. With a little over three minutes remaining in the half, Kade Dyer punch in a score from the 1-yard line to make the score 12-6. The Presidents were able to swing the momentum before half, adding the final score of the first two quarters with just 20 seconds remaining. After a failed two-point conversion, both teams went into their locker rooms with 12 points apiece. Galion was unable to score another point throughout the duration of the second half. Galion was able to gain just 10 yards on the ground against the Presidents defense. Dyer was the main contributed at 13 yards on six carries with the one TD. Through the air, Cooke was a total of 9/23 through the air, with 153 yards, a touchdown and two interceptions in his return under center. The duo of Caleb and Harrison Ivy were the main targets for Cooke against Harding. Caleb had two catches for 69 yards and a score and brother Harrison grabbed three Cooke passes for 36 yards in the defeat. Defensively, the Tigers appeared to be caught on their heels for most of the contest. Presidents tailback Titus Douglas scorched the Galion defense for 161 yards on 22 carries. As a team, Harding picked up 241 yards on the ground with two TD and 210 yards through the air, with four TDs. Galion is now 1-5 overall and 0-3 in the MOAC Red and Harding improves to 3-3 overall and 3-0 in conference play. Cooke hooked up with familiar target Caleb Ivy for a 52-yard touchdown pass. The extra point from Connor Moreton was blocked, but Galion was up early, 6-0. Harding was next to score but missed the PAT to even the score at 6-6. With a little over three minutes remaining in the half, Kade Dyer punch in a score from the 1-yard line to make the score 12-6. The Presidents were able to swing the momentum before half, adding the final score of the first two quarters with just 20 seconds remaining. After a failed two-point conversion, both teams went into their locker rooms with 12 points apiece. Galion was unable to put another point up on the board for the rest of the game. 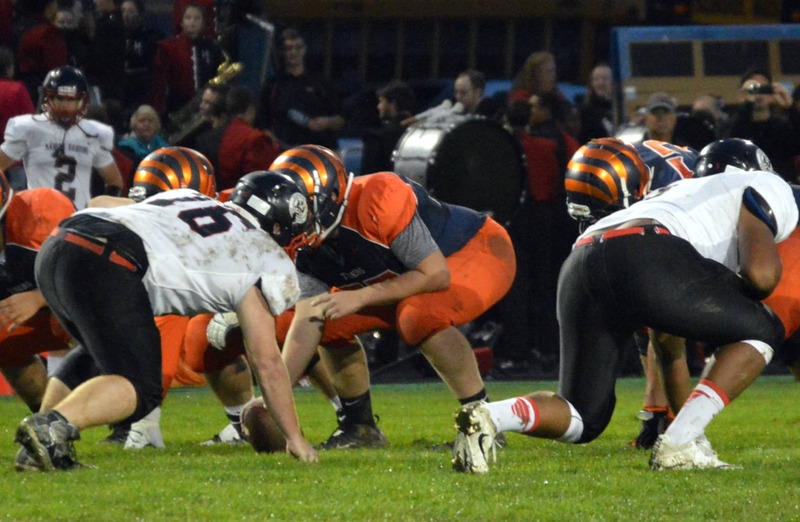 Next Friday, Galion will travel to Caledonia for league play against the River Valley Vikings. The Vikings defeated Fairbanks on Friday to improve to 3-3 overall and 1-2 in the MOAC. Marion Harding will play host to the Jonathon Alder Pioneers. Alder outlasted Buckeye Valley to up its record to 6-0 overall and 3-0 in the league. Check back for more on this game, as well as other local football coverage.